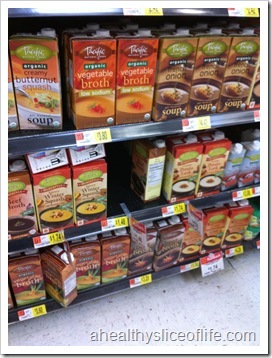 Let me explain… in college I loved Walmart! Everything was cheap and you could return anything- which for a college kid is pretty neat. My roommates and I might have been guilty once or twice of returning MAGAZINES for extra going out money. Sad, huh? or worse. Packed full. 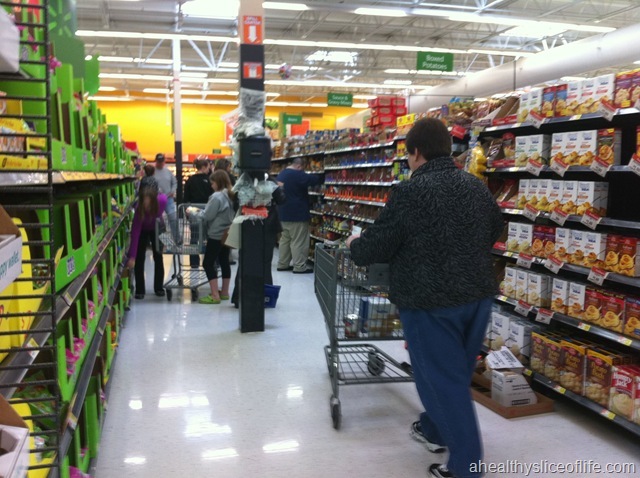 Who wants to navigate that aisle? Buuuuuuuut, yesterday I was on that side of town, had been running errands all day and had to return a side table to Walmart as my last errand, so I decided to challenge myself to do this week’s grocery shopping at Wally World. I wasn’t expecting to find many brands I liked, but to my surprise, some made an appearance! Generally speaking, I do the the prices for these desired brands were lower than at the typical grocery, but not by too terribly much. 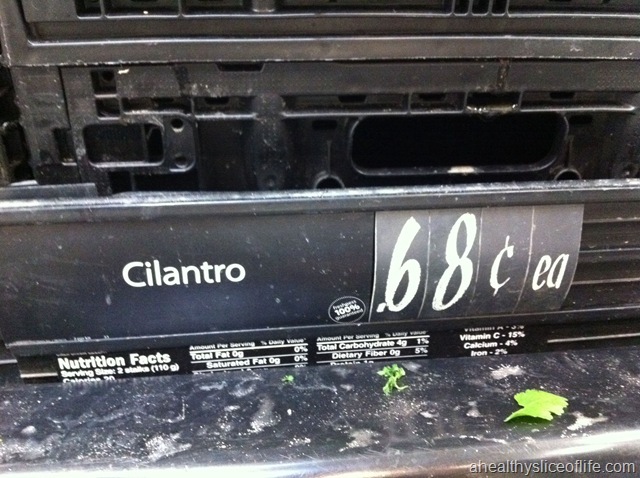 ^ I know that’s cheaper than my local grocery! 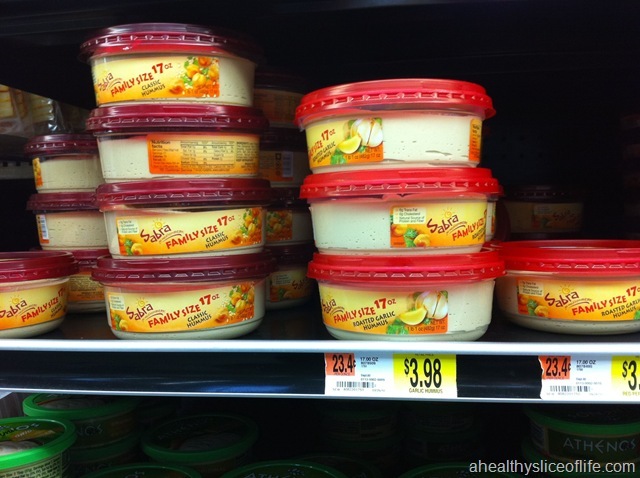 And I love the family sized hummus for the same price as the small tub at Harris Teeter! I was disappointed in the lack of organic produce, and made a few swaps to compensate: with no organic apples in site, I opted for a bag of clementines instead. Instead of buying organic bell peppers, I had to go with conventional because I needed them for a recipe. Peppers are something I try to always buy organic, so this bummed me out. 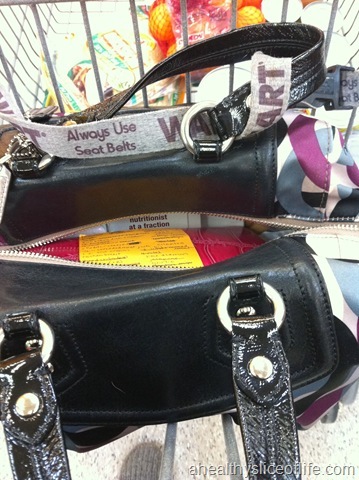 Also, I was warned by a friendly fellow shopper of purse snatchers, and was instructed to strap my purse into my cart. I appreciated the heads up, but didn’t love the fact that purse snatching just comes with the territory of Walmart shopping. Disclaimer: my loot was a bit different than normal because I’m making dinner to bring to a friend this week, but overall, it wasn’t too far from normal. So will I shop at Walmart again? Probably not. It isn’t very close to my house for one, and I don’t enjoy battling the crazies in the parking lot. Plus, I like to try and support local farmers and local health food stores when possible. 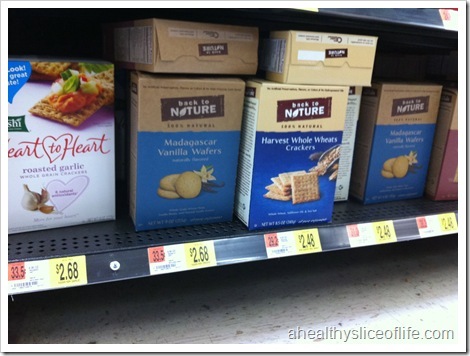 However, I was impressed to find that Walmart did offer some of the brands I search for, and for lower prices. 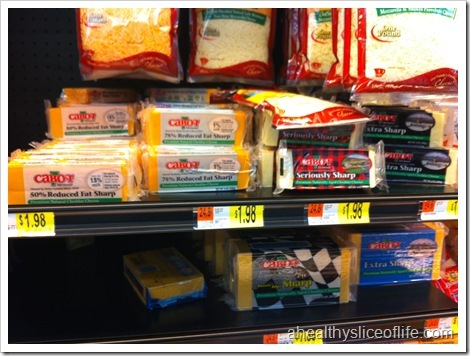 What are your thoughts of grocery shopping at Walmart? Yay or nay? not a huge fan of walmart. I feel gross when I am shopping there. 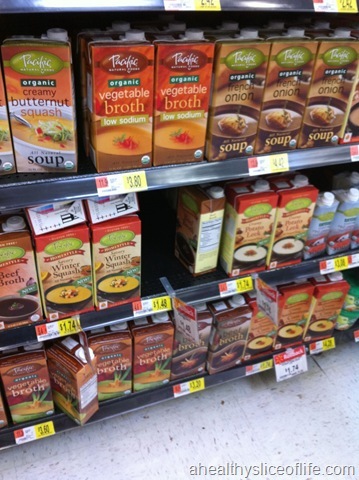 I like their seasonal section when they have them but other than that I try to stay away. look at the steals! walmart scares me bc it’s always so crowded and i can’t handle the lines. those deals might be worth it though. ummm is that not just a seatbelt for kids? it’s a purse holder?? omg. 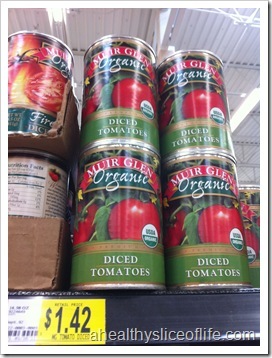 I go to Walmart from time to time–and they are getting better and better brands. 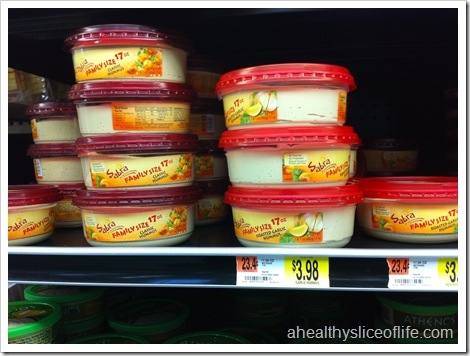 I avoid Walmart whenever possible! If I go I make my husband go with me because I get so stressed out with all of the people. 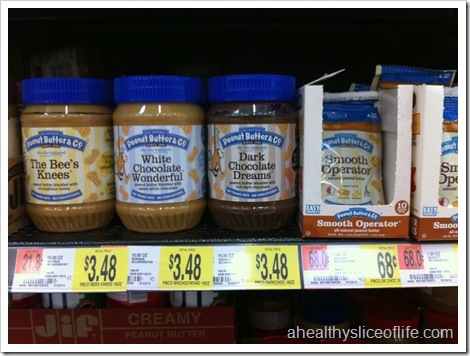 Usually when I run low on my PB and Co peanut butter I just get the hubs to pick it up for me. Otherwsie I try to steer clear! 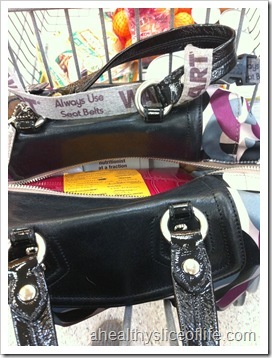 My mom always straps her purse to the cart and immediately thought of her when you mentioned that! And she lives in a small, quiet little town! 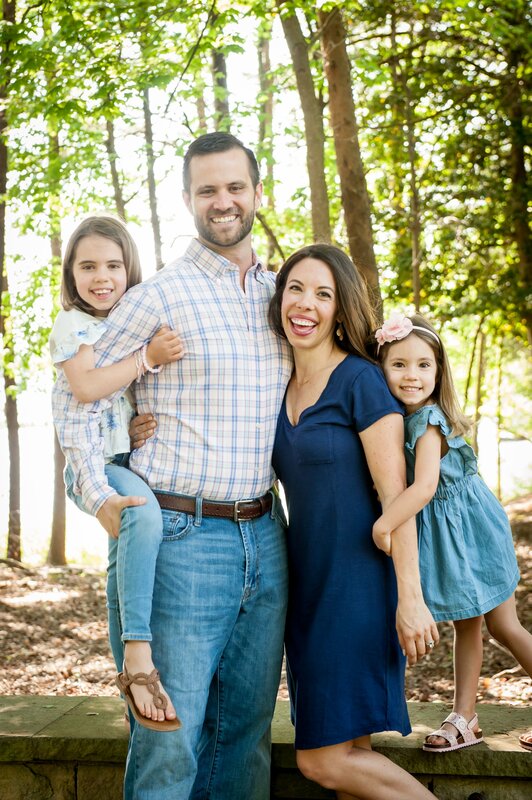 Same as you, I used to shop at Walmart in college, but now I avoid it like the plague – for me, grocery shopping should be a calm and fun experience (I really do need to get out more), and Walmart does not deliver (nor does Super Target). I’m not a fan of the Walmart “experience,” although my hubby finds it vastly entertaining for some reason. That said, I usually go there once in a while to stock up on some things that I have trouble finding elsewhere, and I have been pleasantly surprised to see more organic and healthy choices on their shelves. Walmart makes it into my rotation. I get a prescription at Walmart (and save substantially by choosing Walmart), so at least once a month, I do my grocery shopping there when I pick up my prescription. I also will combine grocery and supply shopping there when I need to buy things like bathroom tissue, cleaning supplies, and random things like an air filter for my car. 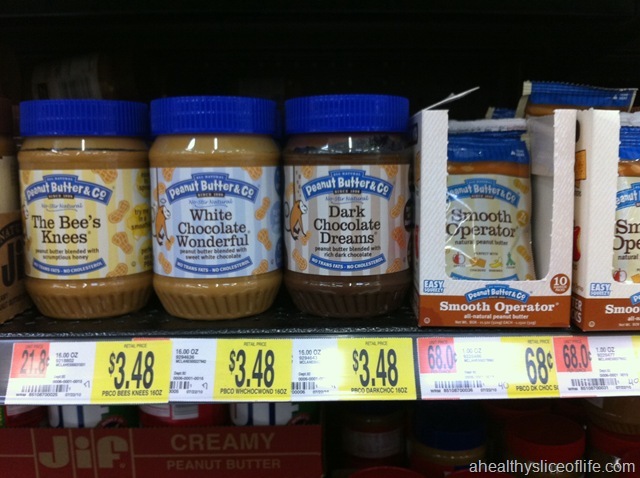 Walmart is actually where I discovered PB&Co. Also in my rotation are Trader Joe’s (not local), Cub Foods (locally owned chain), and some of our bulk items from a small natural foods store. Oh, occasionally SuperTarget, which is also a locally owned chain. From May to December, we get the majority of our produce from our CSA. 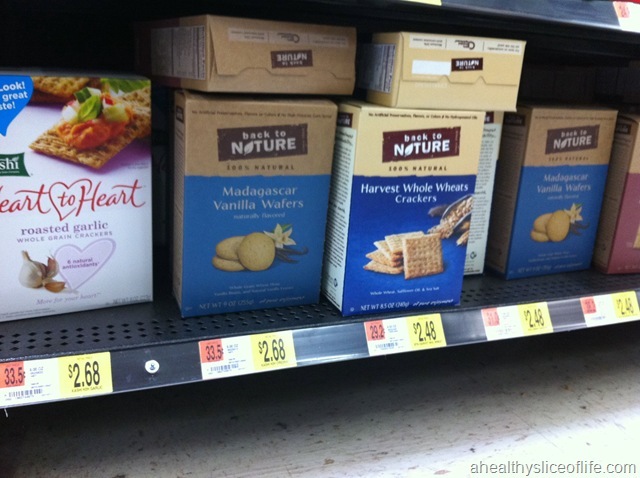 Oh wow, I didn’t know Walmart carried such a variety of brands. 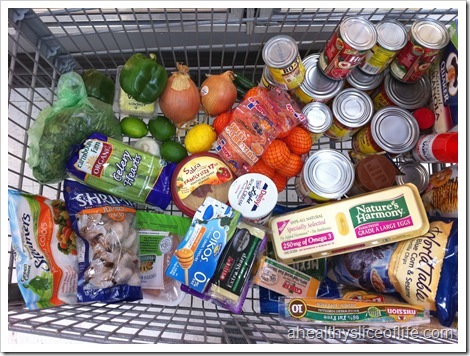 I don’t think I could ever bring myself to grocery shop at walmart – but if I was in a bind and it was convenient, it might happen once or twice. Unfortunately, I am a shopper of walmart for most of my grocery shopping. It honestly does have the best deals than any other grocery store around me and it is the closest to me….so I do what is the easiest and most convienient. I have started going early mornings on the weekends and there is nobody there which helps out a lot. 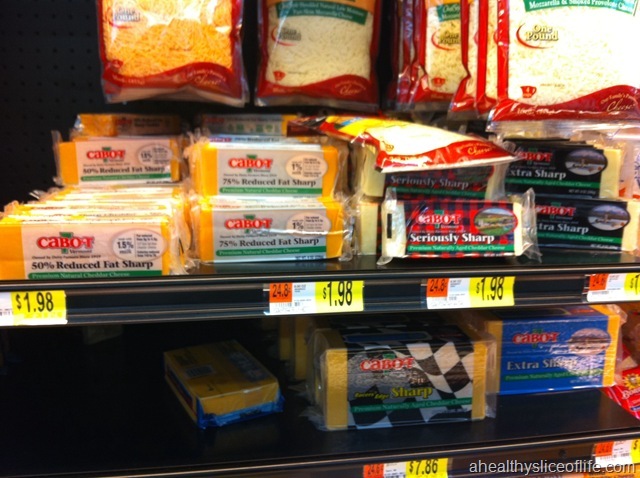 I do go to different grocery stores for better produce though and other specialty items I can’t find at walmart. I rarely go to Walmart. Its to far away to justify frequent trips and I hate the lineups! I would rather shop sales in the weekly flyer and save the same amount with less hassle. I try to stay away for the most part, but do occasionally shop there. And the brands have gotten better. It is just a madhouse anytime I go so try to avoid it as much as possible though I do spend less when I shop there. I don’t really have to combat this problem….no Walmarts in San Francisco or within a 15 mile radius. I have no car, so no walmart for me. I do like Target though. I understand why people go to stores like Walmart or Target. Bad economic times….people need to get the best deals possible. While I like to support local businesses, I also don’t have much extra cash, so I have to draw the line somewhere. There isn’t a Target in the city either…but there is one that is a bus ride away and there are plans for putting on in downtown. I probably will shop there a lot when it opens…..but I will try to still throw as much business to the little guys as I can. I hate seeing mom and pops go under. Thanks for the comparison. Sometimes I feel guilty that I am not shopping at one of the bigger chain stores. I only feel guilty because I feel like I could be being thriftier. 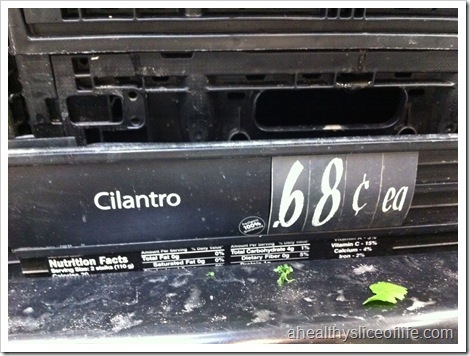 I usually shop at WINCO (has great bulk food for cheap) once a month and then my local health food store or grocery store the rest of the time. I RARELY go to Walmart because it’s WAY out of the way from where I live. They have some good deals there, and lots of variety, but not enough for me to go out of my way to go there. 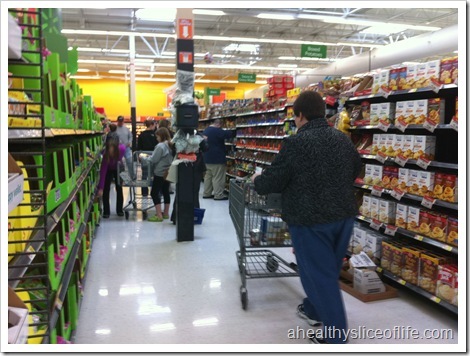 I generally avoid Walmart…it feels so stressful to shop there! I love love love my local Wegman’s. For me, it’s more cost effective than most comparable stores, like Harris Teeter, and the selection is awesome. That said, it’s pretty neat that Walmart is branching out a bit! I would never shop at Walmart because I don’t want to support them. I was also surprised because I thought some of those prices were not that cheap, or at least not cheap enough to shop there. I like in Northern CA and have been doing all my shopping at Whole Foods lately and usually spend $85-$100 a week on food for 2 people. Lots of those things are cheaper at my Whole Foods. 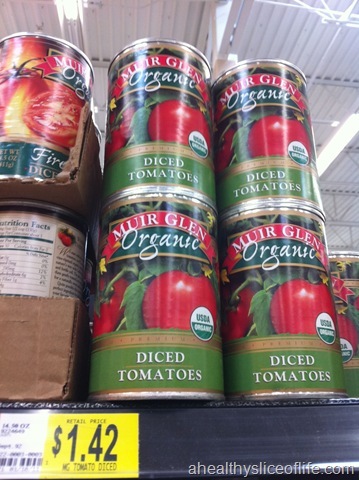 I can get diced tomatoes for $1.00 although I am buying the 365 brand. We actually have a brand new WalMart (with quiet floors) near me and it’s not too bad. I usually avoid Walmarts because they are kind of gross inside if nothing else, but this one isn’t dirty (yet!). 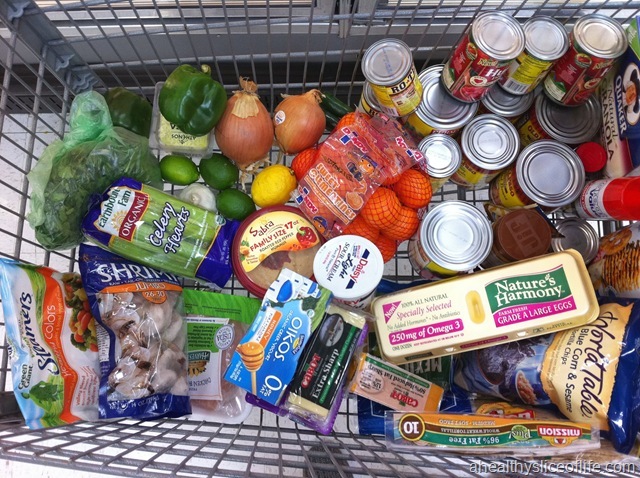 My cart looks a lot like yours when I go- lots of canned beans, dairy, PB, and that sort of thing. I think their produce is usually pretty lack luster and limp looking, but I’ll buy bananas and stuff like that if it looks ok. I think it’s good for canned or boxed stuff once in a while, but I’ll stick with my normal grocery store for most of my produce.